Sony Announces the HDMS-S1D Digital Photo Album | OhGizmo! Sony announced a new digital photo album called the HDMS-S1D recently that features an 80GB internal HDD capable of storing up to 50,000 digital photos. The photo album connects to HDTV sets via HDMI and has multiple methods for importing photos available. 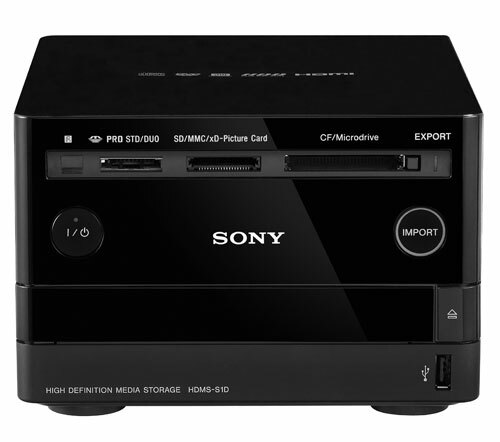 The S1D can import photos via virtually all memory card formats plus CD, DVD, and USB or over an Ethernet network connection. Once photos are imported, they can be managed with the included remote control. Organization options allow for grouping photos by date or events like birthdays and holidays. Photos can be rotated, edited and deleted from the system via the remote. The S1D has the ability to arrange photos for a slideshow or into a digital scrapbook with Sony’s x-Application that is included. The application includes 30 pre-loaded music tracks to set your photos to and you can print photos directly from the S1D to your printer. Pricing for the HDMS-S1D digital Photo Album is around $400 and is available at Sony retailers or the Sony Style website. For another $200, you can get a Mac mini which will do all of those things, and other useful stuff like backing up your photos onto cd, playing DVDs and music, and well, being a computer.